Users have the ability to share Advanced Road Design data between multiple drawings. This could allow for a setup whereby one user in the office is working on the stormwater design for a particular project and another user is working on the road design. Both users can share designs between the drawings. * Share Data – The Share Data command allows the designer to push their design (roads or pipes) from the current drawing to a specified ‘shared-data’ location. * Read Data – The Read Data command than allows either road or pipe data to be read from the shared folder location and added to the current drawing. Shared data cannot be edited except in the original drawing. However, viewing and plotting of the data is allowed in the receiving drawing. Alignments and Surfaces are not shared using the Data Share command – users must ensure that both drawings contain the matching alignment and surface data, prior to data sharing. The Shared Data can be updated at any time by first running the Share Data command and then running the Read Data command in the receiving drawing. If you’re running the Civil3D version of Advanced Road Design, you can turn on an option in the project settings to always directly output a Civil 3D Surface when generating a design TIN. This command can be of benefit when working on smaller-size projects such as carparks or other string-based design projects. When design changes are made, the Civil3D Surface will automatically update. For larger projects, it is recommended that users continue to use the Advanced Road Design Surface and output to a Civil3D Surface using the ‘Civil3D Surfaces‘ command. When the Civil3D Surface is updated, you might find that the Event Viewer might display. 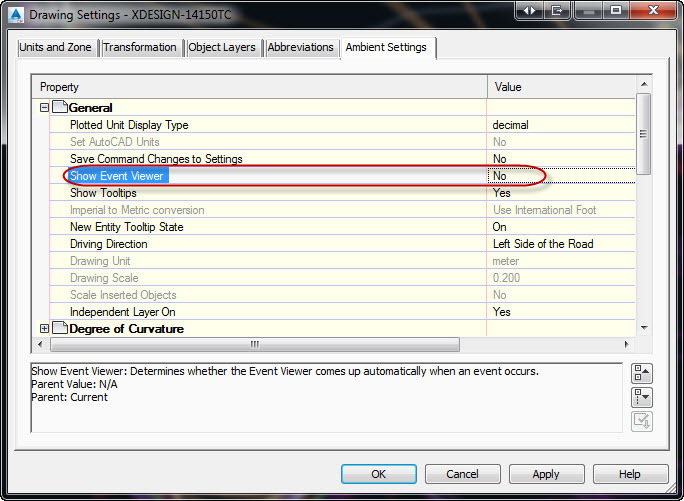 If you like, you can turn this off via the Civil3D Drawing Settings – see image below.